The oral cavity is one of the most delicate areas in a woman's body. The different types of tissue and organs found inside the mouth -from teeth to tongue to gums- require proper lifestyle care, good hygiene, and a healthy endocrine system in order to keep functioning properly. Unfortunately, for many women, this can be a difficult task because the imbalance between their reproductive hormones, mainly estrogen and progesterone, can make the gum tissue very vulnerable, producing swollen, painful gums or even bleeding gums. 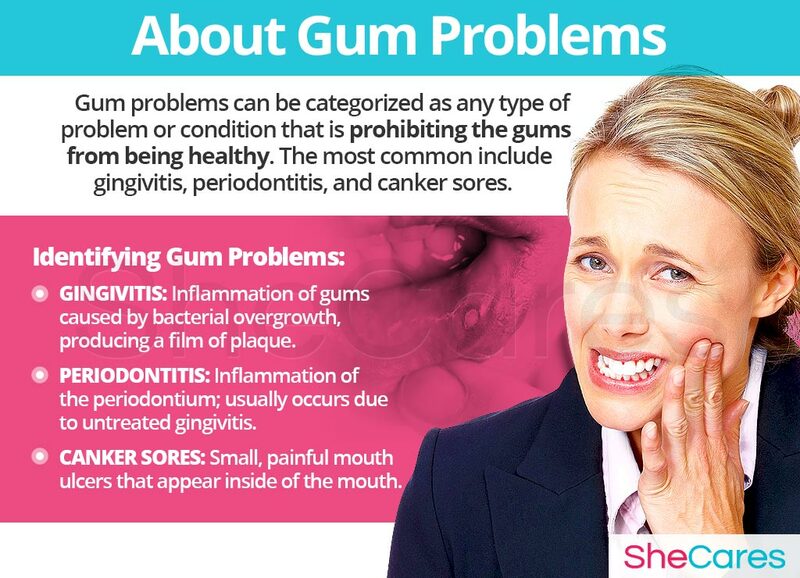 Continue reading to learn about gum problems and the causes, risk factors, symptoms, signs, prevention, and treatment options available. More than one third of women are diagnosed with periodontal disease. Over 70% of adults age 65 and older having periodontal disease, showing that the likelihood of having the condition increases with age. While the complete connection is still obscure, extensive research has connected gum disease with seemingly unrelated conditions such as lung or heart disease. Gum problems are any type of problem or condition that is keeping the gums from being perfectly healthy. There are many specific types of gum problems, but the most common - especially among women - are gingivitis (swollen gums), periodontitis (swelling of the periodontium, usually a complication of untreated gingivitis), and canker sores, which are not to be confused with cold sores or herpes. While gum problems are very common for people from all walks of life, they are overwhelmingly prevalent in women. Women who are at the highest risk of contracting gum disease are those entering puberty, pregnancy, and the years leading up to menopause. It is worth noting gum problems themselves do not have any correlation to or affect a woman's fertility; however, they may suggest the presence of a hormonal imbalance. This hormonal imbalance, in turn, could influence many other aspects of a woman's life, including fertility. As mentioned above, there are three main types of gum problems that are more likely to affect a woman throughout her reproductive life: gingivitis, its more serious form of periodontitis, and the still obscure canker sores. Gingivitis is more common than is generally realized, and so unfortunately this is likely to be the reason for bleeding gums. Recognizing this condition early on can make a big difference, as it is possible to treat it quickly and reverse it before developing into periodontitis. Learning about the causes of gum problems provides the key to understanding how to prevent and treat this troublesome symptom. While the exact causes of gum problems are complex and not completely understood, most doctors and researchers believe hormonal changes are the primary cause of gum problems. In addition to these completely normal hormonal causes, other factors and medical conditions can, in more unusual instances, cause gum problems. Continue reading to learn more about both the hormonal, and other, causes of gum disease. Hormones are chemical messengers that control every organ in the body. So, when changes in these hormone levels occur, certain health disorders can arise. Medical researchers have found that fluctuating levels of estrogen and progesterone - two hormones that regulate female fertility - are linked to a higher prevalence of gum swelling and oral health problems in general. This happens because these hormones affect the way blood circulates inside gum tissues, making them more susceptible to the attacks of opportunistic bacteria and promoting the buildup of plaque. 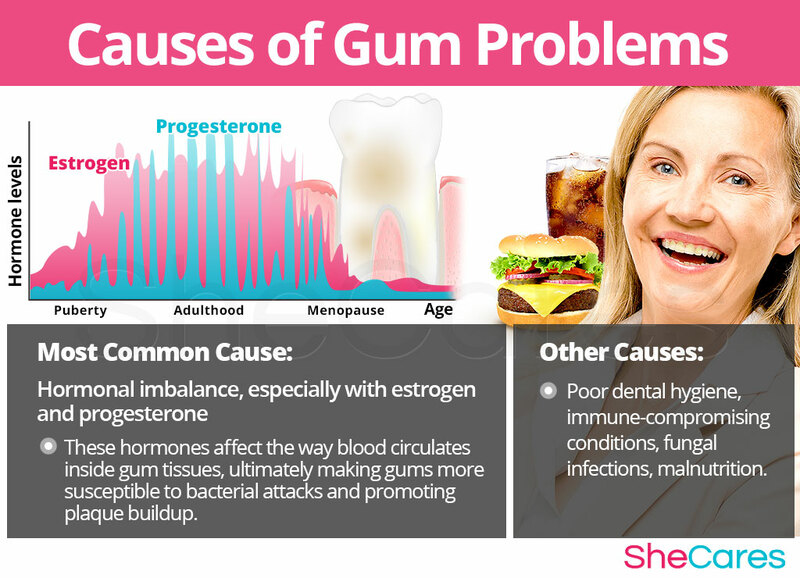 This is the reason why more women experience gum problems during times of significant hormonal imbalance - such as puberty, pregnancy, post-partum, or perimenopause. In this sense, we can say that gum problems are caused largely by the hormonal fluctuations during the transitions women go through during their reproductive lives. Furthermore, there are also specific hormonal causes and environmental factors which can explain the occurrence of gum problems according to the stage of a women's reproductive life in which this disorder appears, such as around PMS and during puberty, pregnancy, post-partum, and menopause. PMS is a consequence of hormonal fluctuations linked to the menstrual cycle. It is a collection of disorders, which may include gum problems, among others. Puberty is the stage in which a girl's body begins to produce reproductive hormones; these and other factors, such an inadequate diet, contribute to gum problems during puberty. Pregnancy leads to extreme changes in the production of reproductive hormones, which along with other factors, like fatigue or bodily changes, can lead to mood swings. Post-partum and breastfeeding is another stage where reproductive hormones are imbalanced, leading to symptoms like gum problems. Also, other factors contribute to gum problems in post-partum, like disruption in routines. Menopause is the stage in a woman's life when production of reproductive hormones naturally decline, signaling the end of a woman's fertility. As well as hormonal causes, other factors add to contributing reasons for the onset of gum problems during menopause, including having to go through other symptoms of menopause. While the immediate cause of gingivitis is always bacterial plaque, a woman's propensity to suffering from it may have different causes. Most likely the condition will be related to hormonal imbalance, but there are other, less common, possible underlying conditions, including fungal infection or scurvy. Keep reading to learn what these risk factors are that have such a profound effect on gum problems. Some women are more likely than others to suffer from gum problems for inherent psychological, behavioral, and health reasons - such as obesity or ill-fitting prosthetics. These predisposing factors can affect a woman's hormone levels and increase the chances that a woman will develop gum problems during her reproductive life, or they may put her at a direct risk of gum problems, independently of her hormone levels. 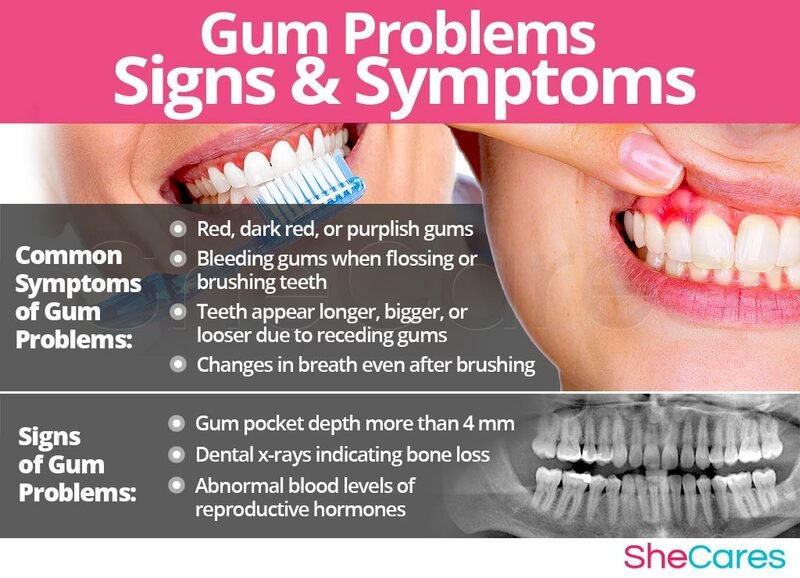 Continue to the next section in order to learn more about identifying gum problems, including their signs, symptoms, and possible complications. Another reason for sore gums can be the presence of ulcers, or canker sores. These usually appear if you accidentally damage the inside of your mouth either by burning it with hot food or drink, biting it while eating, or injury caused by ill-fitting braces or dentures. Because there are different types of gum problems, each one of them will have specific symptoms and signs to watch out for. However, many of these are common for all women going through a phase of hormonal imbalance. To diagnose and identify the symptoms of gum disease, it is best to go see a dentist or hygienist. A dentist will usually review the patient's medical history before conducting an oral examination and ordering additional tests if deemed necessary. In rare cases, when gingivitis is left to progress untreated, it can lead to periodontitis, which can cause more serious complications. However, it is important to remember that in the majority of cases, gum problems such as gingivitis will not require any serious medical intervention, especially if caught during early stages. These possible, but rare, complications of gum problems can include low birth weight babies, infection, and tooth loss. Women who experience severe gum problems may wish to treat or even prevent them. Keep reading below to learn about how to prevent and manage gum problems. While there is no single way to completely prevent gum problems, just as there is no way to completely stave off hormonal processes related to a woman's reproductive life, there are a few steps that a woman can take to lessen her chances of developing gum problems, or to minimize the impact or length of time that symptoms occur. 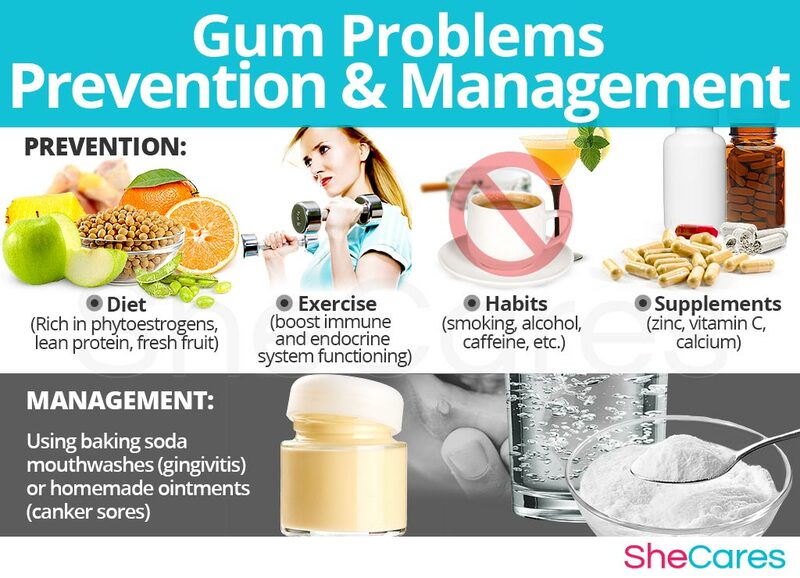 In this sense, lifestyle changes for prevention of gum problems are extremely important, especially in regard to diet, exercise, and healthy habits. Moreover, a woman may seek ways to complement these lifestyle approaches with the use of supplements that help to enhance the endocrine system and, therefore, help prevent or ease symptoms of hormonal imbalance, such as gum problems. 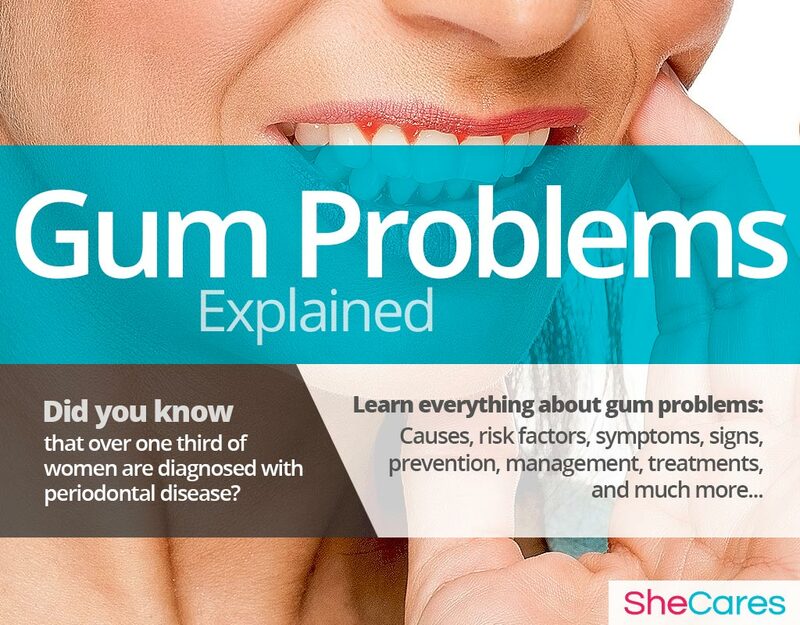 For women who are already going through this disorder, prevention may not be possible if gum problems have already appeared. Fortunately, there are many ways to manage them in order to prevent the “flare-ups” of canker sores or to lessen the intensity of gingivitis (thus avoiding any complications). Keep reading to learn about the different ways to manage gum problems. In addition to keeping an overall healthy lifestyle, the key to managing gum problems lies in a good oral hygiene routine. This should include proper mouthwash use and regular professional cleansings in addition to brushing. Furthermore, there are also specific management tips that can be followed by women during puberty, pregnancy, and post-partum. These alternative, home-based, management tips for gum problems will not tackle the hormonal cause behind them, but can be effective in reducing the pain and discomfort related to acute gingivitis and canker sores. They include baking soda mouthwashes and homemade ointments. While these measures often help to reduce the frequency and intensity of gum problems, they are unable to treat the root of the problem, which is most likely hormonal imbalance. However, there are several natural treatments that can treat the hormonal causes of gum problems. Please continue to the next section to learn more about treating gum problems. Bleeding gums can be a sign of an oral infection, usually the first that many people notice.There are several different ways to go about addressing this pain and bleeding. Find out about the best treatments for bleeding gums and how to avoid this common problem. A receding gum line can indicate a severe oral condition. Fortunately, with the proper care, it is possible to reverse and receding gum line and restore oral health. Learn more about this condition and what you can do to address it or avoid it altogether. In some cases, it may be impossible to prevent gum problems at some point of a woman's reproductive life. Fortunately, because gum problems are also a consequence of fluctuations in hormones such as estrogen, testosterone, and progesterone, it is possible to treat this imbalance. While there is no magical fix, the most effective approach to treating is to combine a few changes in lifestyle with alterative treatment options. Three levels of approaches can be considered for treating gum problems. These are categorized as: (1) Lifestyle changes, (2) Alternative Medicine, and (3) Pharmaceutical and Surgical Options. It is recommended that a woman begins with the least risky option, lifestyle changes, before progressing to the next stage of treatment only if necessary. Drugs and surgery should only be used in extreme cases. Read on for further information about these three approaches for treating gum problems. This primary level of treatment involves the least amount of risk, though, conversely, it requires the highest amount of self-discipline. Often, simple changes in lifestyle can reap huge benefits in fighting gum problems and achieving a higher overall level of health. Fundamentally, an improved diet, regular exercise, and healthy habits can do a woman great service. For many women, lifestyle changes are all that is needed to alleviate the symptoms of gum disease, but they do not directly address the hormonal imbalance that is behind their prevalence, and that may cause other symptoms if left untreated. However, alternative medicine has proven to be an excellent way of treating gum problems among women of reproductive age in a safe and natural way. Alternative approaches involve little to no risk and can be an extremely effective way to treat gum problems. In the case of herbal supplements, there are two main types that can be used: phytoestrogenic and hormone-regulating herbal supplements. These supplements, such as black cohosh, contain estrogenic components produced by plants that complement the low estrogen hormones in a woman's body, helping alleviate gum problems. By introducing plant-based estrogens into the body, these herbs treat the underlying estrogen deficiency behind gum problems. These supplements can be considered the safest and most natural way to treat the underlying hormonal imbalance behind gum problems, and can be taken throughout a woman's life as they support the body's natural hormone production. Additionally, there are some other types of supplements that can also alleviate gum problems or at least make them more manageable, including vitamins and other herbal supplements. A combination of approaches is usually the most effective route to take. Lifestyle changes combined with alternative medicine will most likely be the best way to alleviate the symptoms of gum problems. However, for some women, the symptoms will be so severe that a more drastic treatment is necessary. Interventions at the third level involve the highest risk and often the highest costs. Not all treatments are suitable for women at every life stage. So, it is strongly recommended to speak to a licensed healthcare practitioner before considering any pharmaceutical treatments or surgical procedures for gum problems. There are three main types of medical treatments that can be used to treat chronic or advanced gum problems: hormone-regulating medication, root planing, and dental surgery. Hormonal replacement therapy (HRT). This is a quick and strong way to combat all symptoms related to hormonal imbalance during the years leading up to menopause. However, it can entail serious side effects -like hard to control weight gain - and there is very strong evidence pointing to a link between HRT and an increased risk of breast cancer, ovarian cancer, and blood clots. Oral contraceptives. When gum inflammation appears strongly related to PMS, it may be possible to control it using oral contraceptive pills since they can stabilize hormonal levels throughout the menstrual cycle or make periods disappear. However, this option is not suitable for women who are pregnant or breastfeeding. Root planing. This is a type of treatment for gingivitis that involves smoothing the root surfaces under each tooth in order to make tartar buildup less likely. Pocket reduction surgery (flap surgery). This is an ambulatory surgical procedure (requires local anesthesia) that involves cutting into the gum tissue to expose the dental roots in order to perform more in-depth scaling and planing. Soft tissue or bone grafts. These procedures are reserved for very advanced periodontitis, where the root or the jaw bone has been damaged. They involve taking some donor soft tissue or bone fragments and using them to regenerate the damaged areas. These approaches are not mutually exclusive. A woman may use different approaches at different times or any combination of them, depending on the duration and severity of symptoms. 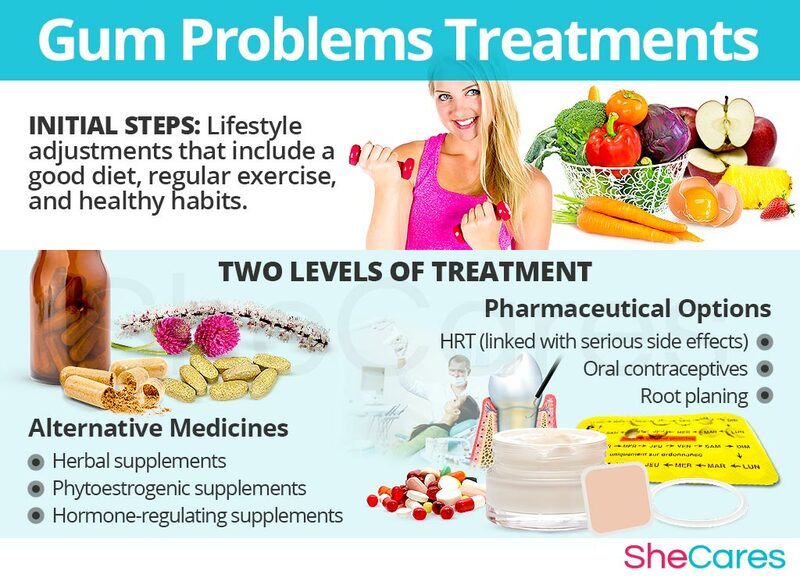 Today, more and more women find that dealing with symptoms of hormonal imbalance is best accomplished via a combination of healthy lifestyle and alternative treatments.